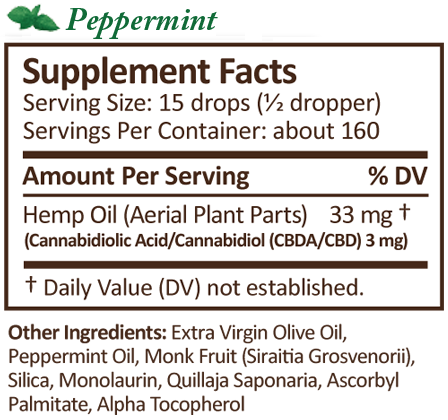 Click the button below to add the PLUS CBD Oil CBD Drops Peppermint 500 mg 2 oz to your wish list. Our Plus CBD Oil™ Drops are made using our raw oil, the total plant CO2 extraction from agricultural hemp, offering the fullest spectrum of naturally-occurring hemp co-factors. It is comprised of cannabidiolic acid or CBDA, an acidic cannabinoid that is produced directly in the plant and contains many beneficial properties distinct from CBD. Directions: 15 drops or ½ a dropper daily.